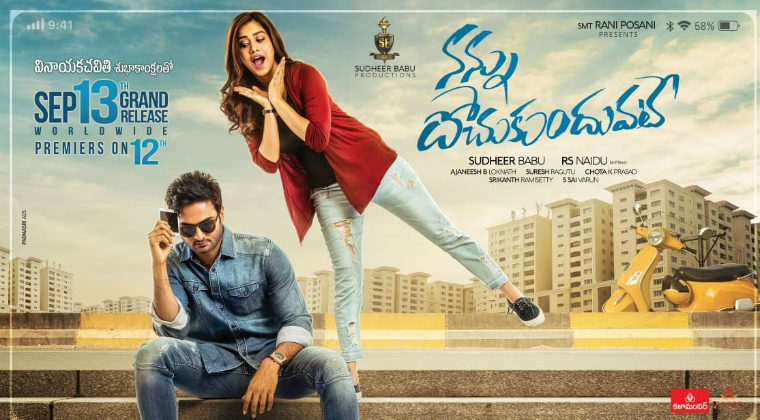 Hero Sudheer Babu’s upcoming movie ‘Nannu Dochukunduvate’ is going to hit the screens on September 13th. After getting a tremendous response for the teaser, the makers have made this official announcement. Touted to be a romantic entertainer, Sudheer Babu is turing producer with this flick. RS Naidu is directing ‘Nannu Dochukunduvate’ while Nabha Natesh is playing the female lead role. Ajaneesh Loknath is composing music. Special premiere shows are being planned a day before the release. Next articleఆర్ఎక్స్ 100.. 10 కోట్లు నాటౌట్..! Mahanati satellite rights yet to be sold!